Inform the HMI that an application has unregistered. The named application has unregistered from the mobile side via an appropriate RPC. The connection and corresponding session(s) are closed due to transport connection issues (for example, WiFi/BT connection closing on mobile device, USB unplugging, etc.). A HeartBeat timeout occurs between the mobile device and SDL Core (if a HeartBeat timeout is set). HMI must distinguish distinguish between an unexpected disconnect and a regular exit from the unexpectedDisconnect parameter. HMI must removed the named application from the list of registered applications. 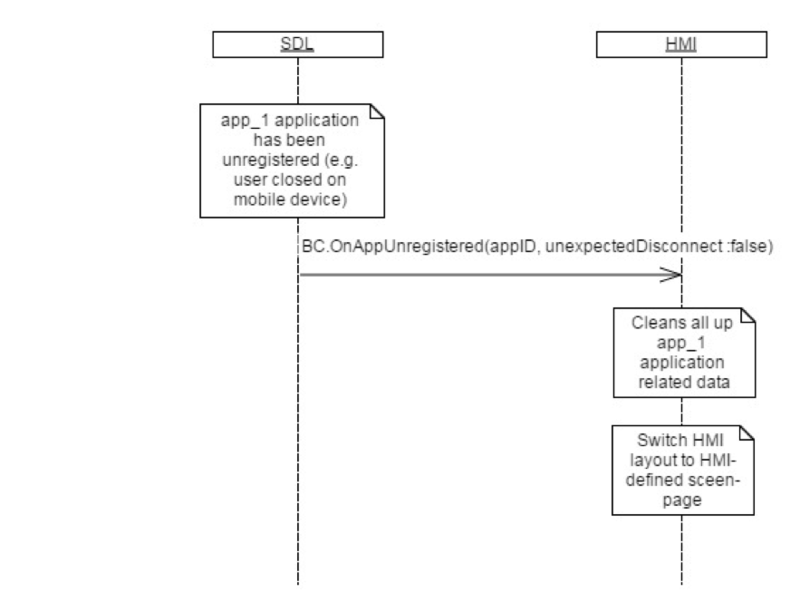 In case of an Unexpected Disconnect, the HMI may display a popup of some kind that reports a connection with the named app was unexpectedly lost. In case of any type of disconnect, the HMI may switch to a Home screen that displays a list of other registered applications. The HMI may delete all application data after an app disconnects, except for VRGrammars.